From ancient times, we Norwegians have been a seafaring people. Not just because we love the sea, but because we’ve had to be. Today, an excellent system of passenger and car ferries makes it both easy and pleasant to travel to even the most remote parts of the country. Even today, car ferries are a fact of life in Fjord Norway and Northern Norway where fjords cut deeply into the landscape and make it impossible – or at the very least inconvenient – to get up or down the coast by car without crossing the fjord. Hurtigruten, the coastal steamer that serves more than 30 ports along the Norwegian coast, still traffic the coastline from Bergen in the south-west to Kirkenes in the far north daily. Far from all the passenger boats in Norway accept cars, by the way. Many towns and cities have small passenger ferries, from tiny “Beffen” in Bergen and “Sundbåten” in Kristiansund to the ferries that connect Oslo to the islands in the Oslofjord. In the Lofoten Islands, the various boat services form the geographical glue that keeps many of the islands connected. Along the coast, express boat services serve to bridge the gaps that the trains cannot cover. From Stavanger via Bergen and to various communities in the Sognefjord area, catamarans provide speedy and convenient travel from one place to the next. The same goes for various small villages in the fjords, which in earlier times could only be reached by rowing boat. Especially in Fjord Norway, where you find the world famous fjords, the road suddenly ends and the journey continues by ferry. Express boats and car ferries sail up and down the coast, in sheltered waters and across open seas, to towns, villages and islands large and small. They provide good logistics for a holiday of island hopping or an itinerary of your own choosing. Be warned, there may be queues in the summer months. 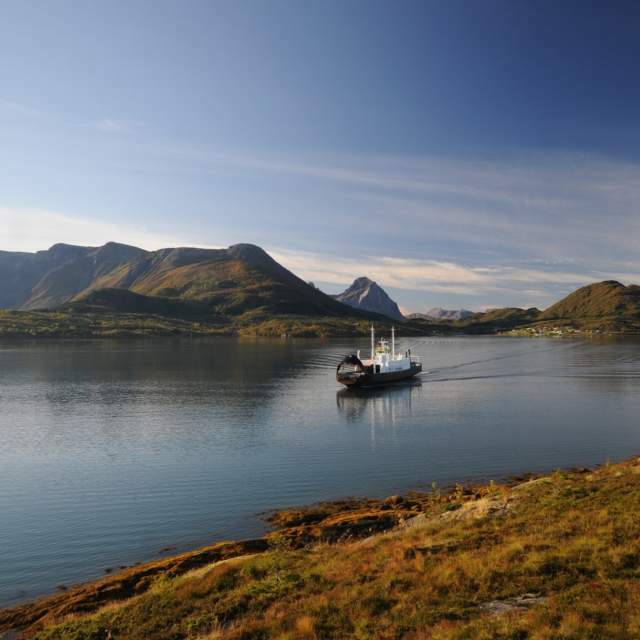 For the most popular ferries, we recommend that you queue early: Geiranger–Hellesylt and Lauvvik–Lysebotn. The long-established Hurtigruten sails from Bergen to Kirkenes in Finnmark. The journey Bergen–Kirkenes–Bergen takes 11 days. This voyage is an exquisite way to experience the natural beauty of the coast. It is indeed “the world&apos;s most beautiful sea voyage”. What fascinates tourists most are all the tiny and not-so-tiny communities they stop at along the way. Departures are daily, and there are frequent stops along the coast. The ships can accommodate cars, making it easy to combine the cruise with a holiday in different places ashore. AD: Check rates at Hurtigruten - "The World’s Most Beautiful Sea Voyage"
It is not only coastal Norway that offers boat trips. For example you can take a trip on Norway’s largest lake Mjøsa with the world’s oldest paddle steamer Skibladner. Or travel in the Jotunheimen mountains with the Gjendebåtene boats. The travel planner Entur gives you travel suggestions from door to door by bus, train, metro, boat, and aeroplane, whether you want to check when the next bus is leaving from your destination, or you are planning a holiday from Vestfold to Vesterålen. Download Entur from the AppStore or Google Play. From Germany (Kiel), Color Line’s ships Color Fantasy and Color Magic take you to Norway. Color Line also sails from Sweden (Strömstad). In Norway, drivers and cyclists often share the road and thus must follow the same traffic rules. Whatever your vehicle, here are some tips to keep all of your wheels firmly on the road. Every city and town in Norway has a local bus service, and there is an extensive network of express coaches throughout the country. There are more than 50 airports in Norway, making even the northernmost communities accessible by plane. The three largest domestic airlines are SAS, Norwegian and Widerøe. In Norway, nature is never far away. It’s actually so close that even public transport is a great starting point for exploring it. Filter your search and check out the boat and ferry services below.